I love food. I love going out for food, I love cooking food, I love talking about food, and I love daydreaming about food. Food is just the best. However, as much as I love food, and regardless of how much I blow my hard earned cash on it, I don’t know whether I’d go to a restaurant on my own, pretending to be stood up, just to get a free meal? Especially on Valentine’s Day! Seems a bit over the top, but one guy in America managed to pull it off – maybe he was just a week away from payday and desperate? 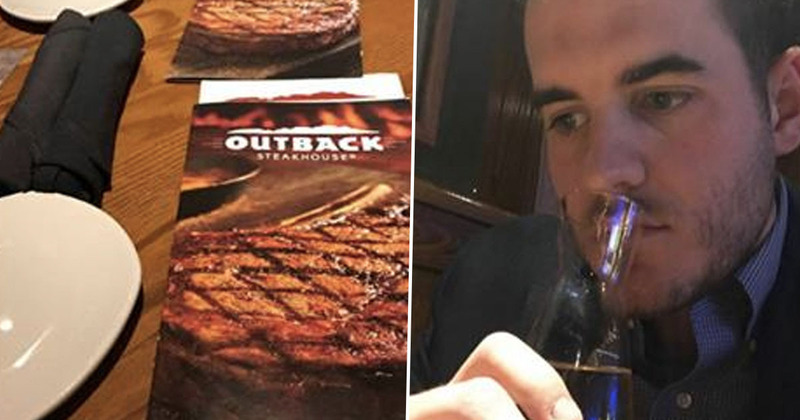 Stephen Bosner from Maryland, got one over on Outback Steakhouse – the Australian-themed American restaurant – on February 14, and tweeted live updates of the whole scenario. Stephen then said he’d called ahead so didn’t have to wait long, telling the waitress it was fine as his date was ‘running a little late’. Stephen’s cunning plan including ordering a chardonnay for his ‘date’, leaving fake voicemails when staff were near his table so they’d hear, and even a fake present…’Jumper cables from his trunk wrapped in paper from a shoe box he’d had on his back seat’. Wow! This is a hell of a lot of effort for a free steak. I’ve never been to Outback Steakhouse so, for those of you that have, is it really that good? After a lot of faffing about, and a couple of starters, the waiter informed Stephen the kitchen was closing in 15 minutes, so at 9:45pm, he ordered his steak. the waiter just talked to the bartender. i’m sitting in a booth at the bar and every single person within eye range has glanced at me at some point during the evening. Then… The waterworks started. Maybe you’ve got a career in acting Stephen? This is where Stephen’s story gets better though. ‘i still haven’t gotten a check. i KNOW this waiter is getting ready to clock out for the night [sic]’ he tweeted. However, one couple at the bar – who were probably feeling sorry for him – paid for his uneaten food. How nice of them! Stephen revealed he’d made a donation of $50 to the American Civil Liberties Union (ACLU), uploading a picture of their response as proof. They only went and replied! How about you bring in a real date and the meal’s on us? The love connection is up to you though. ♥️ Send us a DM so we can make it happen. Fair play to Outback – I thought they’d be mad at him, but it looks like they saw the funny side of it all. If you want to read ALL of the tweets, check them out here. Others on Twitter, however, didn’t seem to think Stephen should be rewarded for his actions, calling him a ‘moron’ and ‘sociopath’. What do you think? Did Stephen take it too far, or does his donation and tip make up for it?